Understanding how to do SEO for a website is a crucial part of online marketing and your web strategy. Because search engines send the most consistent and sustainable website traffic. Some reports suggest that over 60% of all web traffic comes from organic search results, compared to only a fraction from social media, referral sites and other channels. If search engine traffic is so important, the question then becomes… What are the major search engines actually looking for? And more importantly, how can you optimise your site to effectively communicate to them? To answer these questions and help you get started with SEO, we created the SEO Planning Template. The SEO Planning Template has been downloaded tens of thousands of times as a part of our 33 Web Marketing Templates, and offers a simple 3-step process for planning your SEO strategy. Bonus: Download the “SEO Planning Template” to master keyword research and plan your website’s SEO strategy. Let’s start at the beginning… What exactly is SEO? SEO is short for “Search Engine Optimisation”. It’s the term used to explain the processes a website needs to go through, in order to make sure that it remains visible in search engine results. Search engines such as Google and Bing use complex algorithms when deciding what pages, articles or sites they show to a user when they type a query into the search bar. Understanding the most important elements for influencing this algorithm, and “communicating” effectively with search engines, is what SEO is all about. Keyword research is where your SEO journey begins. “Keywords” are the terms that people type into a search query, and they play a significant role in getting your business found by the right people. Your goal is to discover the most common words your ideal customers are searching for, and then create content on your site that is optimised for those words in an attempt to show up in a search result. The significance of keywords in SEO is not as prominent as it used to be, because the search algorithms have become more intelligent at ranking relevant content and pages. In the past, people would stuff as many keywords as they could on a page in a hope that they would quickly shoot up the search rankings for that term. These days, practices like that are frowned upon and regularly penalised by search engines. However, keywords still provide the quickest and easiest way for communicating to search algorithms exactly what the pages on your site are all about. Keyword research helps you confirm that the topics you THINK are interesting, are ACTUALLY interesting based on whether or not people are searching for them. Keyword research helps you communicate in a language that search engines understand. Keyword research makes sure you are getting the right TYPE of visitors to your website, and not just a bunch of people who are unlikely to buy what it is you sell. Keyword research helps you better understand your target customers. By analysing search trends you can unveil topics and interests you never thought of before. So despite keyword research being a little tedious, it is worth it if you want to improve the SEO performance of your website. How do you get started with keyword research? What are their biggest problems, fears, dreams or aspirations? Or perhaps more obviously, what is it you DO to help them? Literally start typing one of those things into a Google search and look out for the Google instant suggestions to brainstorm ideas. 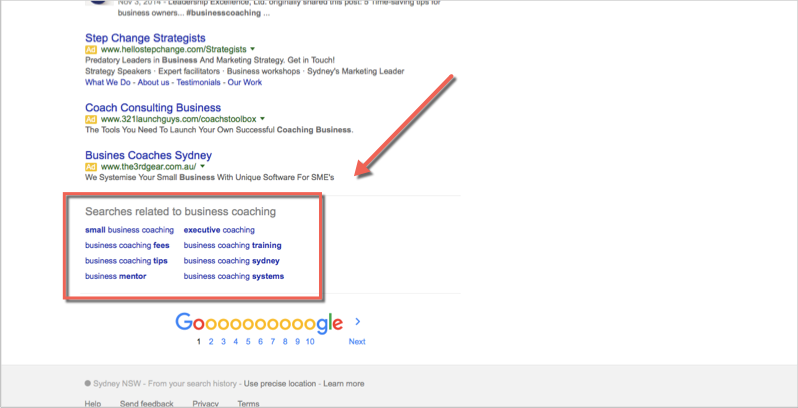 For the same search, jump to the bottom of the results page and see what other keywords are in the “Related search”. These words are gold because Google is telling you EXACTLY what people have searched for before. Capture these ideas in a spreadsheet or another document for potential use later. Long-tail keywords are the supporting phrases that partner your primary keyword terms. They are much more specific in nature, and hence get significantly more targeted search traffic, because the user intent is clearer. KeywordTool.io shows a list of potential long-tail keywords that stem from your primary ones. You can rinse and repeat this process as many times as you like, but the goal is to end up with a set of keywords that your customers are likely to search for. Therefore you can make pages on your site that are optimised to turn up in these searches. On-page SEO is about optimising each of the web pages on your site, so they have the best chance to rank for your chosen keywords. Each page on your site should ideally be optimised for ONE keyword term only, so it doesn’t confuse the search engines about what page to rank. As you may know, the Google search algorithm changes quite regularly. The reason they change it is usually because they want to improve the user experience for their searchers. Making sure your site and pages load quickly has become a contributing factor to whether or not you can rank in search results, because a slow loading site will likely cause people to leave. Seeing user experience is so important to Google, having a clean website design and site navigation is also something to look out for, not to mention it improves your brand credibility. Including the primary keywords you want to optimise your page for towards the beginning of the H1 header tag will also help. As well as the headline of your page, try to include your keyword phrase in the first 100 words and in other sub-headlines throughout the text. But it’s important not to “stuff” your keywords in everywhere, this is considered spammy and will result in a drop in SEO performance. Try to balance keyword optimisation with readability and user experience. Multimedia or visual content, such as video and infographics, are a great tool for improving user experience on your site. How does Google know? They consider it a good thing the longer someone stays on your website without leaving. So if you can engage websites visitors for a long time with helpful content, videos and exciting visuals it will positively influence your SEO performance. Making sure your site is mobile-friendly and responsive across multiple devices, is having a growing effect on where you will turn up in search results. For every page or post on your site, you should personalise the meta description based on the users search intent. The “meta description” is more simply just the brief paragraph of text that shows up in search results under your headline. This is the text that will compel a user to click on your article. A great tool for WordPress users is Yoast SEO, it will help you optimise the meta description for each page on your site with an easy interface and suggestions. Another thing to consider in terms of optimising your website for search engines is to have a sitemap. You can see our sitemap features in the footer menu of every page. Finally, make sure your website is fully integrated with Google Webmaster’s Tool, this helps to index your pages. It’s focus is more on promotional methods and getting your website found on social media, bookmarking sites and perhaps most importantly attracting links from other credible websites. Whilst you can influence these elements, they are largely out of your direct control – which is why they are usually bucketed separately to on-page SEO. Credible domains linking back to your site. “Credible” in this case is referring to a domain’s authority. Authority is determined by a number of different factors, but to simplify things you can just download the Moz Chrome Plugin and see the domain authority ranking, out of 100, for any site on the internet. The “relevancy” of the links coming back to your site. If a page is very relevant to yours, a link will hold more weight in Google’s eyes. For example, if a Health and Fitness site linked to a site about Knitting it’s probably not “relevant” and subsequently is considered a low quality link. A diverse range of links is also a consideration. If you have the same type of link over and over again it will start to lose it’s effect. The text that actually links to your domain can also influence where your site ranks. In the past it used to be better to have the exact keyword text linking back to your site. For example, the words “list building” linking off to a page about “list building”. However, this is now considered a spam indicator by Google, because it is highly unlikely that another site would know what words you have optimised a page for without you directly influencing them to do so. Google wants links to be organic and earned as much as possible. As I mentioned, off-page SEO is to some degree out of your control. However, if you consistently produce valuable content, and actively promote it to enough people with an effective social media strategy, the links will start to come. Without a doubt, SEO is a pretty overwhelming topic. And getting results is challenging within a short period of time. However, if you follow the basic principles in this article for how to do SEO for a website – producing quality, helpful content time and time again and then optimising that content for on and off page SEO – you will start to see a positive return on effort over time. It’s a long-term commitment, so don’t expect results overnight. But that commitment is worth it, because eventually you start to drive consistent traffic to your site without needing to put in the grunt work every day, or pay for it. If you think first about your customers and what they would find helpful, that’s a great starting point. Attract them to your site, keep them interested, and encourage them to share your content with others… Eventually Google will come to the party. But just to be sure, remember to optimise your pages too! If you haven’t already, download the “SEO Planning Template“. It will give you an easy 3-step process to start your SEO journey.